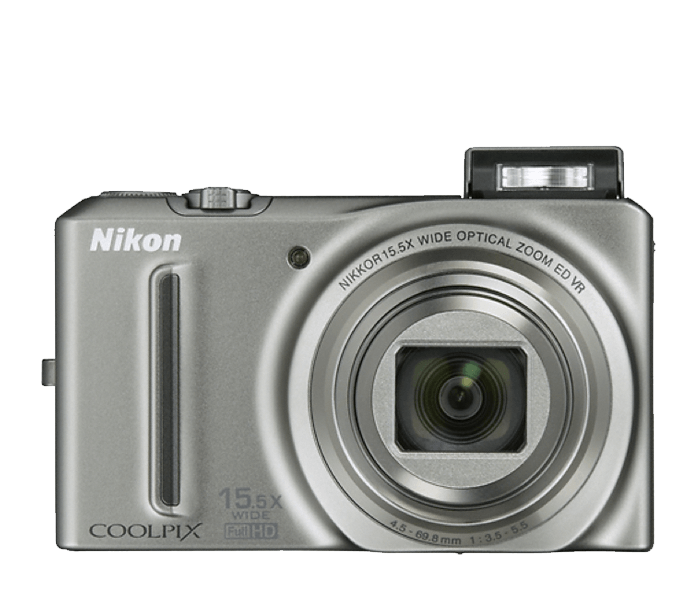 The COOLPIX S9050 combines an impressive 15.5x wide-angle optical Zoom-NIKKOR glass lens and a 12.1-megapixel CMOS sensor for great photos and videos—even in low light. With extensive filter options and special effects, your images can take on a new creative look. Capture a fleeting moment with fast framing rates and Full HD (1080p) movie recording. Weighing in at just 7.6 ounces, you’ll take the S9050 everywhere. Capture shots from end zones to distant vistas with the S9050’s 15.5x zoom range that covers from wide-angle (25mm) to telephoto (388mm). The S9050’s remarkable Zoom-NIKKOR glass lens renders sharp, clear images. Plus, S9050’s built-in VR image stabilization system minimizes the effects of camera shake for incredible images and videos. Life is a party after the sun sets, and great pictures are made with ease. With the S9050's amazing 12.1-megapixel CMOS sensor, you can capture all the night's action with low noise for better images and videos. For incredible landscape shots at night use the Night Landscape Mode; the S9050 will take a series of images and automatically combine them in the camera for an amazing shot. The S9050 also excels as a movie camera. Simply press the easily accessible record button and start recording. Even record slow- and fast-motion movies for creative and entertaining moments. Sound is automatically recorded in stereo and the HDMI port enables easy hook up to an HDTV. Get a clear view of the action with the S9050’s high-resolution monitor. A large 3-inch display with wide viewing angles, anti-reflective coating and brightness adjustment gives you a clear look of the world. 460,000 dots provide a sharp, clear display in both image and movie capture and playback.